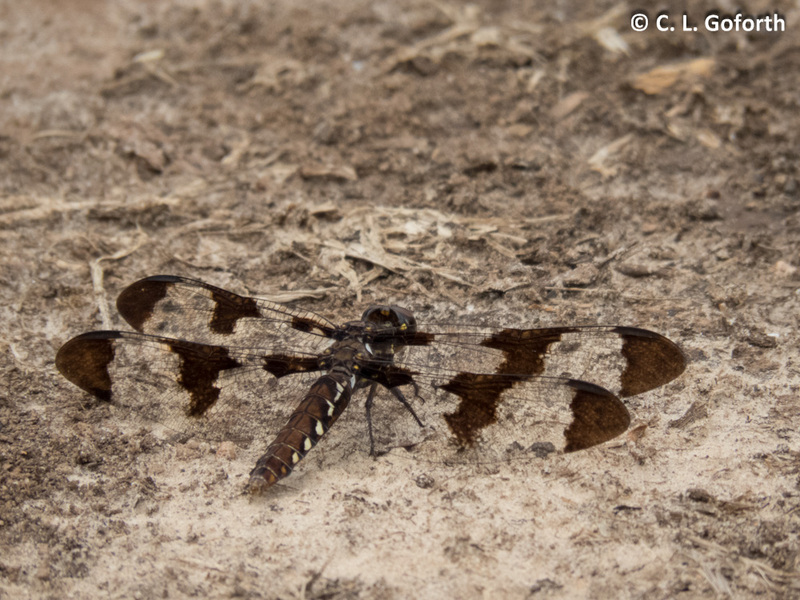 I’m always impressed by how huge the territory for some of the large dragonflies are. Insects never cease to amaze me. The Photography 101 assignment for the weekend was to explore the rule of thirds/composition and create a gallery, so I spent a fair bit of the weekend looking for interesting things to photograph. And it has been a great weekend! I’d been away from North Carolina for 6 days and it’s amazing how much changed in just those few days. It was still winter when I left. Now it’s spring! Gorgeous weather and fun activities made for an excellent couple of days. I work on Saturdays, so I spent a small part of the day out and about to see what’s happening currently at Prairie Ridge. I saw my first butterfly, my first carpenter bee, my first frog, my first snake, and my first blooming redbuds of 2016. I heard Fowler’s toads and bullfrogs and found the snake when I heard a bullfrog scream and went to see what was trying to eat it. 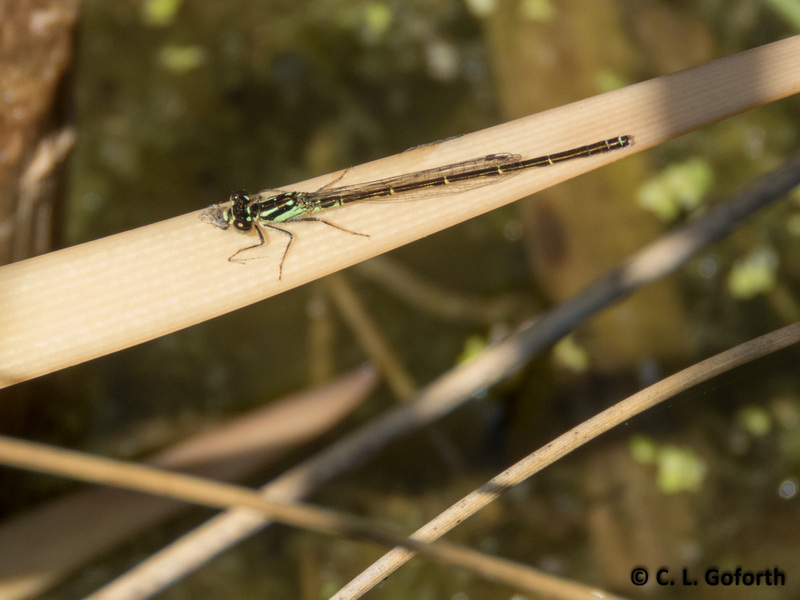 I saw FOUR green darners at the pond (migrants most likely) and two species of damselflies, though I didn’t get close enough to any of the odonates to get photos or ID the damseflies beyond noting they were both from the family Coenagrionidae as they whizzed past into the cattails. Hopefully I’ll get a better look soon! My first carpenter bee of 2016! Sucking on nectar of a redbud, which started blooming while I was out of town. No insect in this photo, but deadnettle is an important food source for the early pollinators that emerge here in the spring. It’s a weed and spreads like crazy, but it does provide important food in the winter when other sources of nectar are scarce. Pawpaws are an awesome American fruit tree that a lot of people don’t know about. Their flowers, which are just starting to bloom in this photo, end up a deep purple-red and smell a little like rotting meat. They are highly attractive to flies, though they weren’t quite far enough along to attract pollinators yet. I don’t know what this tree is – a bay, myrtle, or holly – but it was blooming like crazy and was absolutely covered in bees! Bees that flew away the moment I pointed the camera at them… How can you have hundreds, maybe thousands, of bees on a small tree without capturing a single image of one close up? This was the best shot I got, with a bee flying by in the upper right corner. The weather was amazing, so it was great to get out and wander a bit. Lone seal on a tiny sandy island! Crab remains on the beach. This was once a good sized crab, one that people would probably be happy to eat. Not an invertebrate, but I can’t resist putting in this less-than-stellar photo of a flounder! This was the best seine capture, a mere 2 inches or so long. It’s amazing how well they blend in! A fly on the beach. I’m assuming this is a brine fly or some other type of fly that specializes in salty habitats, though they were very flighty and I really didn’t get a good look at any of them. Teachers seining for fish and other creatures. The barrier island we visited. Quite small, but loads of fun. I drove back through a bunch of nasty rainstorms afterwards, but it was totally worth it to get on a boat and learn some cool things about the NC marine environment. I don’t spend nearly enough time on boats these days – and I even live in a state that actually has water now. It’s sad when you spent more time on boats in the desert southwest than you do in a rainy place with real rivers and huge lakes! 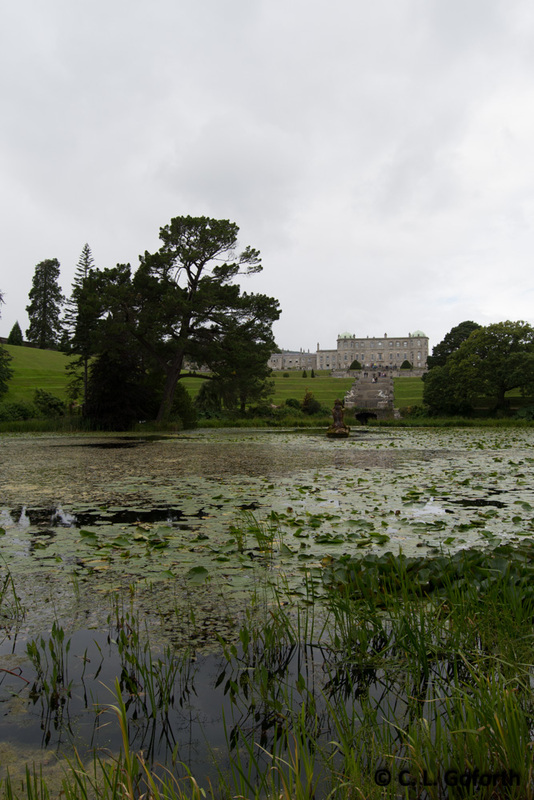 So that was my weekend, which I loved because I got to spend a lot of time outside taking pictures of things I saw. What did you all see? Anyone seeing dragonflies where they live yet? I’m excited that it’s warmed up – there should be some baskettails and corporals out in my area soon and the whitetails won’t be too far behind! This post is going to be a bit longer than my usual Wednesday posts. It’s not going to live up to the Well-Nigh Wordless name today, but I feel the need to tell a longer story, you know? A while back, I posted a photo and told a story about a group of girls that I worked with last year that was particularly wonderful. This group of girls included mostly low-income, mostly minority, teenage girls, a combination that often (in my experience at least) means that the students aren’t at all interested in what I have to teach them and they don’t want to do the activity I have planned. 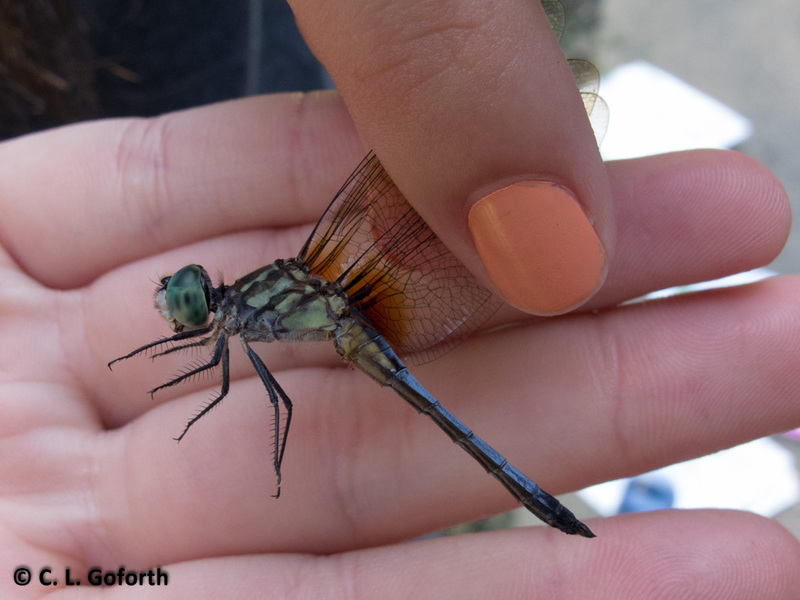 Anyone who’s worked with groups of teenagers knows how important appearances are to that age group and how it’s often not cool for a teen, especially a teen girl, to show an interest in something like a dragonfly. Few things break my heart like seeing that one kid who really wants to play with some bugs, who wants to learn, but pretends to hate it like everyone else so he/she doesn’t stand out. That was 100% not the case with the group I worked with last summer! They were THRILLED about the dragonflies and were completely and utterly engaged the entire two hours I spent with them. I practically had to drag them back inside when our time was up. That experience ended up being one of the highlights of my year. 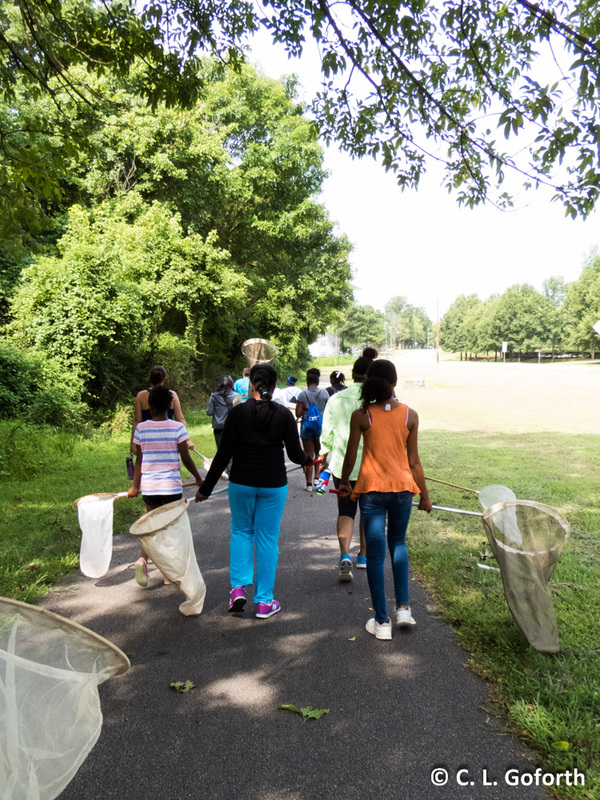 I just have to say that, as someone who LOVES teaching people about insects and getting people outside to learn about the natural world, moments like these remind you of why you put up with any crap you have to deal with in your job. These are the moments that make up for anything that’s ever gone wrong, any group that hated what you presented, and completely validate your career choices. I am still on this amazing high from working with this group today – and I hope it lasts the rest of the week! It’s been incredibly hot in my part of North Carolina this week, and the heat just happens to coincide with the start of my busiest teaching season. Because I’ve been outside sweltering in the sun and humidity a lot this week, I’ve come across quite a lot of interesting things,but I’m also exhausted. Today I am keeping Friday 5 simple and just sharing some dragonflies I’ve photographed over the last few days. Let’s start with a few common dragonflies. 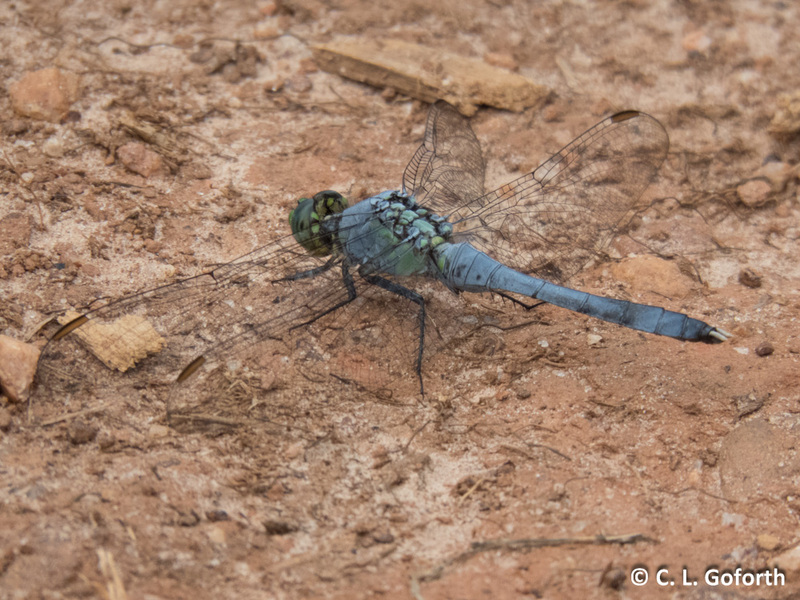 That’s a blue dasher, a relatively small dragonfly that’s found throughout a good part of North America. I see them all the time. They’re at the pond, all over the grasses, sitting in trees, sitting on the ground, almost everywhere! I took this particular photo yesterday while working with a group of high schoolers with special needs who are part of a science careers program a coworker and I are involved in. We had just netted this one, photographed it for a citizen science project, and I was about to let it go when I asked if anyone wanted to help release it. 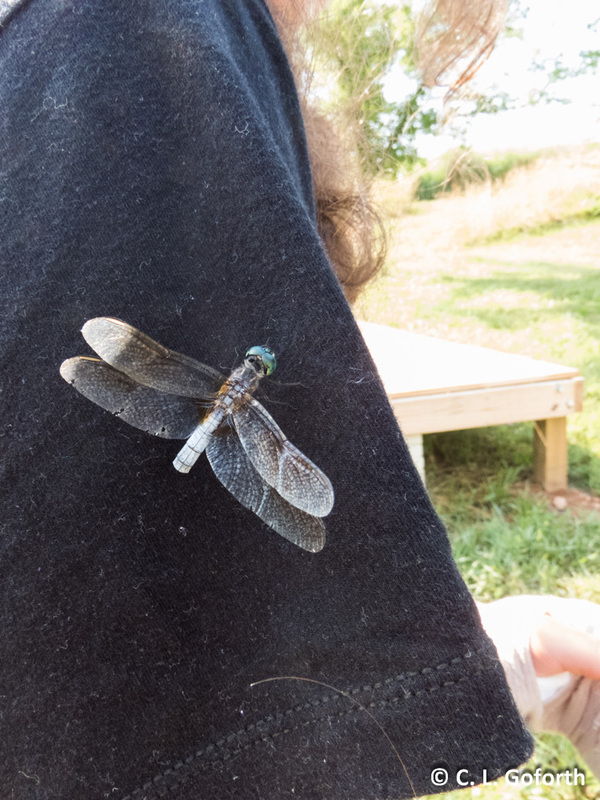 This young woman volunteered, so I put the dragonfly on her sleeve. It sat there long enough to snap a photo, so I got to document a happy moment for a very promising young woman. What an awesome group to work with! I find dozens of males at the pond each time I visit, but I find most of the females sitting on the trails far from the water. They seem to like basking in the sun in little patches of dirt, so a walk down nearly any trail will likely yield you a half-dozen or more females. I love the patterns on their wings! Gorgeous, even if they are super common. The eastern pondhawks, both the males depicted in the photo and the green females, are often found near the female common whitetails on the trails. They seem to be particularly abundant recently, though it could be that they’re hot and behaving a bit differently than usual. This particular male is showing a little bit of green on his throax. While they appear blue, it’s because they grow a waxy coating as they mature and it’s the wax that gives them the bluish tinge. Underneath the wax, the males look just like the females. My first Halloween pennant of the year! I never see these at the ponds, but last year I saw lots of them out in the prairie. Here’s hoping I’ll see many more this year! I have always wanted to get a photo of a bird with a dragonfly in its beak and today it happened! 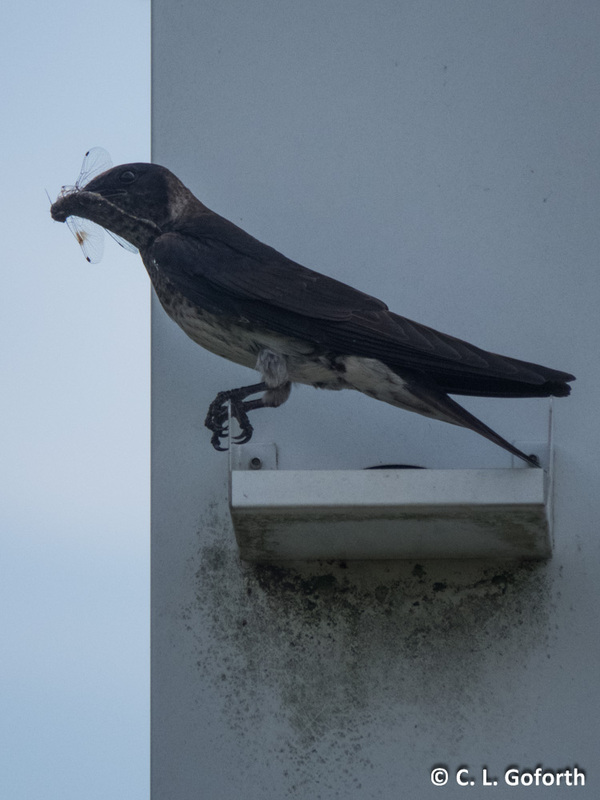 That’s a purple martin with… I’m not sure. I was thinking it was just a blue dasher, but upon closer inspection there’s a distinctly clubbed tail on this dragonfly, which makes it both a) very exciting because we have never gotten a confirmed report of any clubtails at Prairie Ridge and b) annoying because I don’t think it’s possible to ID it from this photo. 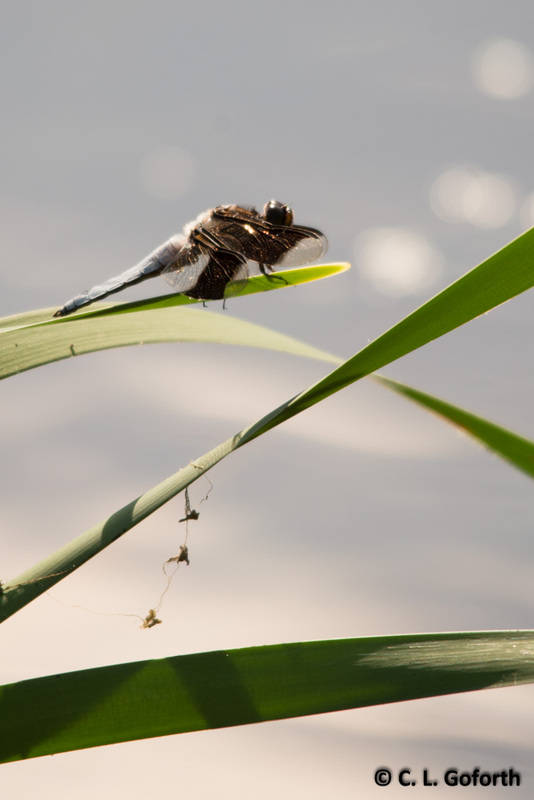 Shortly after I snapped this, the bird turned around and took the dragonfly inside the nest. When she came back out, the dragonfly was gone, so I imagine that it’s now residing in the bellies of 4-5 hungry baby martins. All in all, a good couple of days dragonfly-wise. This summer is shaping up to be very interesting, so even though it’s ghastly hot, I’m still thrilled to spend as much time outside as I can. I don’t want to miss a thing! Now this photo is truly terrible, but I couldn’t get my camera to respond as quickly as I’d like. 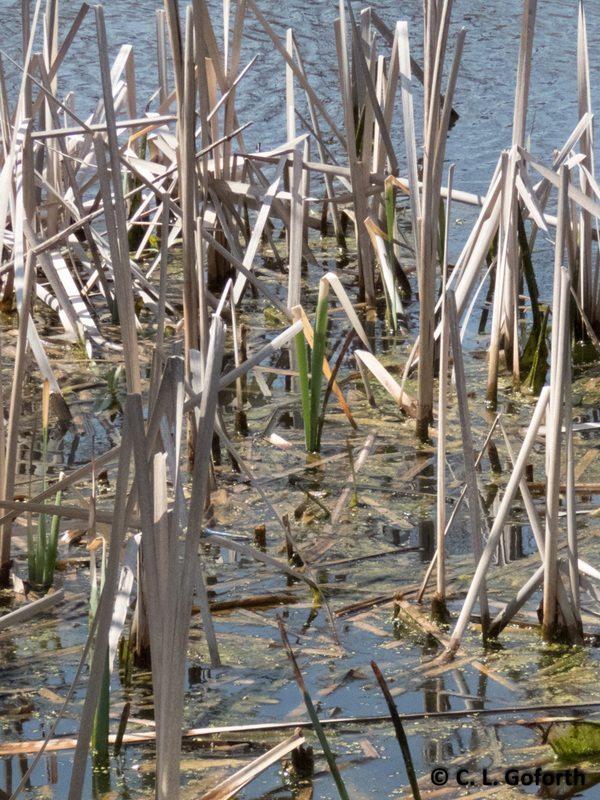 I challenge you to find the dragonfly in this photo at all! 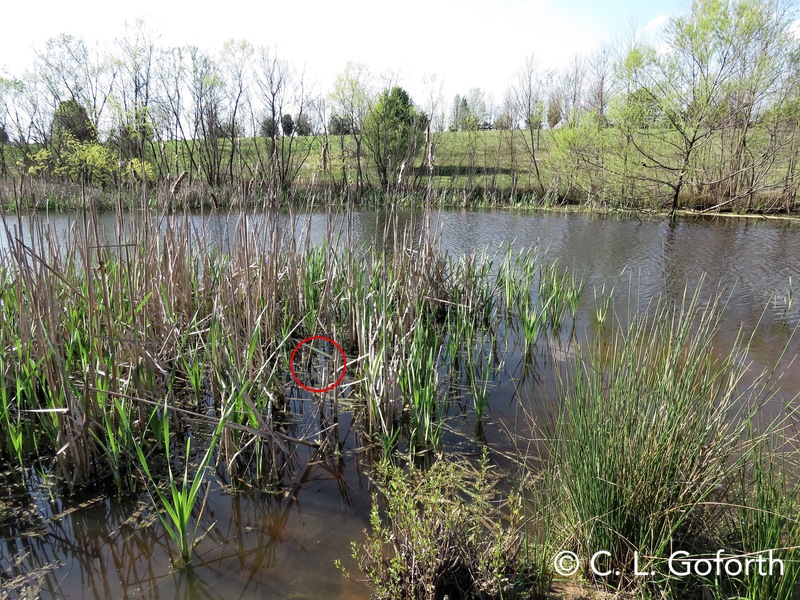 However, there IS a common green darner in the photo, and it was one of six at the pond. I saw two pairs mating, so 4 males and two females. I suspect these are migrant green darners. The nymphs in the pond are all still too small to be emerging and it’s been too cold for too long for me to expect them to be coming from our pond this early. Between that and the fact that I’ve been hearing reports of big migratory and static darner swarms in Florida, I think that these are green darners stopping over on their way north for the summer. These dragonflies come out very early relative to other dragonflies and I tend to see very, very young individuals on the rare occasions that I see them at all. This is a photo from last year as the photo I took yesterday didn’t turn out at all, but it was nearly identical in appearance. I find these when they fly, almost drunkenly, from an area near the pond to the grassy hill beside the pond and crash into the grass. For whatever reason, nearly every blue corporal I’ve ever seen has been freshly emerged and its wings have hardened just enough for it to fly badly a very short distance. The wings will darken a bit more and become a little less glossy once they finish hardening. The body will also change colors and the abdomen will expand some as well. This dragonfly had probably been an adult for an hour, so brand spanking new! This photo is from last year too because I only caught a quick glimpse of a pair of common whitetails in tandem, zooming off over the prairie and they never came back. I got just enough of a look at them to know that they were whitetails for sure, but definitely didn’t have time to get the camera pointed at them before they disappeared. These are some of our earliest dragonflies each year, and one of the last to disappear in the fall. 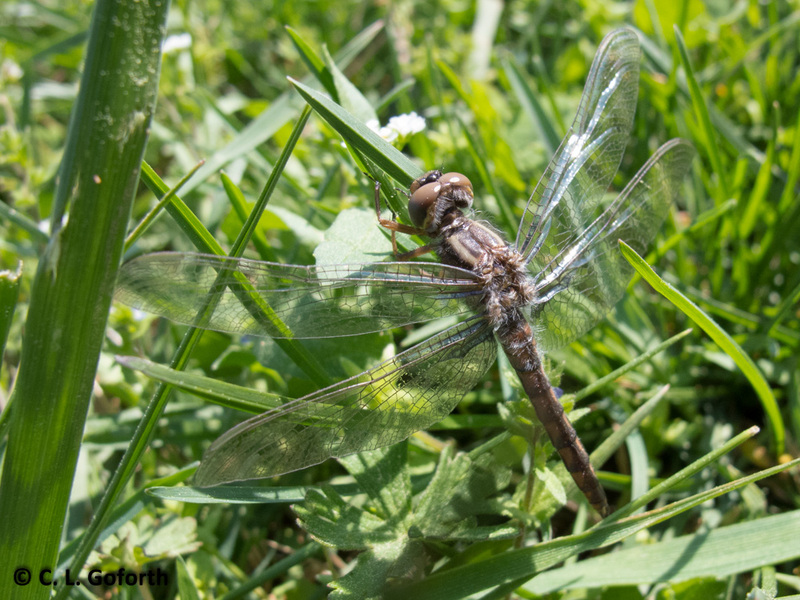 If I had to pick a dragonfly to represent Prairie Ridge, it would be the whitetails as they are far and away the most commonly spotted dragonflies throughout the season. This has been the earliest damselfly I’ve seen the last few years, and it was the first I saw this year too. They are easy to tell from other forktails at the pond by the exclamation mark shaped pattern on the thorax, clearly visible in this photo. They also tend to be smaller than a lot of the other damselflies you might see flying with them, though this one was quite a bit larger than the average fragile forktail I’ve encountered. If you look closely, you’ll see that this one was in the process of eating a small insect when I snapped this photo. Dragonflies are back out!! After what was a long and cold winter (at least by North Carolina standards), it’s lovely to see the dragonflies out and about again. 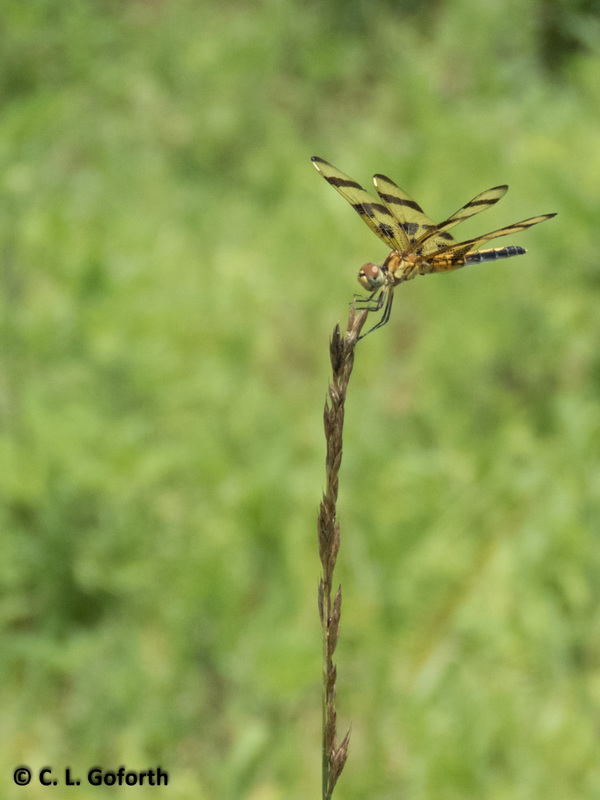 Who else out there is seeing dragonflies? Anyone want to share the things they’ve seen recently? That group of girls was awesome, and just thinking about them makes me smile. So much fun! Long time no post, I know, but I’ve been wrapped up in a lot of different things recently and haven’t had time to even think, let alone post on my blog. But I think things are calming down a bit and I’ll have more time to do the things I like. I’m eager to get back to blogging! I am working on getting through my massive backlog of dragonfly swarm data to get it up on Sunday this week and I should be posting on Friday. Here’s hoping nothing else comes up to prevent that happening!